Many Canadian football fans like to discredit either the NFL or CFL (depending on which they prefer) based on ratings. It seems it is a never-ending war between the two sets of fans (full disclosure here, I watch both). The fact is, comparing the ratings of the two is difficult. The CFL only plays four games a week, all of which are on national TV and never conflict with each other. On the other hand, the NFL plays anywhere between 12 and 16 games a week, any many of those games conflict. The numbers for Sunday Night Football are never truly accurate because BBM Canada, who keeps track of ratings for advertisers, doesn’t include people watch on NBC. Monday Night Football is comparable to CFL games, but it rarely features two top teams. The playoffs are a bit easier to compare, but there is still the issue of the NFL playing more games. While it is reasonable fans will watch two CFL playoff games in a weekend, it is a lot less likely a person would watch all four NFL playoff games in the Wild Card or Divisional rounds. Not to mention two NFL playoff games in those rounds go head-to-head with Hockey Night in Canada. Of course the CFL playoffs face competition from the NFL, while most sports (and TV series) avoid competing with the NFL playoffs. Then there is the Super Bowl vs. the Grey Cup debate. Yes, there are those who watch the Super Bowl just for the commercials, or just for the halftime performance. How many, we will never know. Because of these factors, it is easy for a fan of one league or the other to make a case that their favourite league is the most popular. It is easy to selectively choose variables to support your opinion. However, there are two indisputable facts. CFL ratings were down from 2010 to 2011 and NFL ratings were up over the same period. 4.6 million watched the Grey Cup in 2011, down from 6.04 million in 2010. The two CFL Divisional Championship games averaged 1.54 million in 2011. In 2010, those same games averaged 2.0 million (note: the 2010 East Final includes RDS numbers because the Alouettes played in it. The two games in 2010 averaged 1.75 million on TSN, still above the 2011 number). Sunday’s game averaged 8.15 million on CTV and RDS. That is up almost a million viewers, from 7.3 million last year. The Conference Championship Games averaged 2.2 million in 2012, compared to 2.12 in 2010. Those numbers are a small increase, but an increase nonetheless. It is an indisputable fact that CFL ratings were down in 2011, while NFL ratings were up. More people are watching American football, while less are watching the 110 yard game. Will it continue in to 2012 and beyond, who knows? The CFL better hope not because it will sign a new broadcasting deal sometime this year. There are really only a few postseason games that are comparable between the two leagues. The obvious is the Super Bowl and the Grey Cup. 8.15 million and 4.6 million; a difference of 3.55 million. Last year the difference was only 1.26 million. There are factors in play, such as NFL competition against the Grey Cup, the Grey Cup only airs on cable and those who only watch the Super Bowl for ads (which is a pointless argument considering nobody likes the Canadian ads anyway), but I don’t think these factors would account for more than a third of Super Bowl viewers anyway. It wasn’t that long ago that the two games were neck and neck in the ratings. This wasn’t true this year. The NFL Conference Championship and CFL Divisional Championship games are also comparable. The network/cable and NFL competition factors are still in play for these games. The NFL games are also played two hours later (3pm ET and 6:30pm ET, compared to 1pm ET and 4:30pm ET for the CFL games), which usually results in a small increase in ratings. The CFL games averaged 1.54 million, the NFL games 2.2 million; a difference of 660, 000. Not anywhere near as big a gap as the Grey Cup and Super Bowl, but still an increase from only 120, 000 in 2010. Finally, the CFL’s Divisional Semi Finals and the NFL’s Divisional Playoffs. The Sunday games are comparable. They were both played on Sunday afternoons at 4:30pm ET. One of the NFL Sunday games is even on TSN in Canada. One can’t use the NFL’s Saturday games in the comparison because the CFL doesn’t play on Saturday. Canadians don’t traditionally watch football on Saturday either, we watch hockey. That is why the CFL reverted to playing their playoff games against the NFL after playing them on Saturdays for just one year in 2008. The CFL West Semi and AFC Divisional Playoff both aired on TSN at 4:30pm ET (the NFL game also aired on FOX, so advantage CFL here). The CFL game (Stampeders @ Eskimos) averaged 1.253 million; the NFL game (Giants @ Packers) averaged 1.244. Of course it is hard to believe that at least 100, 000 people didn’t watch on FOX (I did). The early games had 1.6 million watching Tiger Cats @ Alouettes on TSN/RDS and 1.12 million watching Texans @ Ravens on CTV. TSN tends to average 400, 000 to 700, 000 viewers for Sunday Night Football and Monday Night Football, depending on the matchup. CFL on TSN ratings come in slightly higher, usually in the 500, 000 to 800, 000 range. The are a number of factors, including the high number of NFL games per week and those who watch Sunday Night Football on NBC that make these hard to compare more closely. For me, the main difference between the two leagues is the number of casual viewers. Each league has about the same amount of fans who every week, as the numbers for the regular season and early rounds of the playoffs prove. However, the NFL’s ratings take a significant jump for the Conference Championships and the Super Bowl compared to the CFL for the Divisional Championships and the Grey Cup. This was more clear than ever this season. There is probably no doubt that the NFL is the second most watched league in Canada, after the NHL. However, the CFL has nothing to be ashamed about for coming in 3rd, well ahead of baseball and curling. The two leagues are forever linked in Canada because they are direct competitors. It is pointless to argue about which is more popular. Some people need to remember many of us are simply football fans. After hockey, football is the second most popular sport in Canada. Editors Note: To those reading from the Saskatchewan Roughriders forum, yes these numbers are accurate (or at least as accurate as BBM can be). They are BBM 2+ AMA numbers sourced from BBM itself, CTV and TSN (who in turn originally got the numbers from BBM). I did not make them up. Some include both the English and the French broadcast, while others don’t (mostly because RDS numbers aren’t always available). However, I made every effort to make the fairest comparison possible, including using RDS numbers for any Alouettes playoff games (for the NFL, I’ve only included RDS for the Super Bowl). Anyone who uses this post to prove one league is superior in popularity is missing the point. If you want to question them, please question them here. I tried to register with the Riders forum yesterday so I could discuss it with you guys, but I still don’t have posting privileges. This entry was posted in CFL, NFL, Ratings. Bookmark the permalink. You’re talking about soccer, right? I wouldn’t be surprised if, on average, NFL+CFL+NCAAF viewers outnumber soccer viewers. Note that I said “viewers”, not “fans”. It does… By a lot. Premier League and MLS usually only get 100, 000-300, 000 viewers. The Champions League final only 500, 000 (so basically1/10th of football). You should be aware that BBM Canada includes the ratings for those Canadians watching NFL games on American channels when the game is simulcast on CTV or CityTV. Only TSN and SportsNet NFL games are not simulcast. Not sure why you’re comparing the CFL semi’s to the NFL finals, but the CFL ratings were 20% higher than the NFL’s for the first two rounds of the 2011 playoffs. The CFL playoffs also compete against a full slate of NFL Sunday games while the NFL playoffs had no football competition. Three Canadian NHL teams played on Grey Cup Sunday while none were scheduled against the Super Bowl. I didn’t compare CFL Semifinals to NFL Conference Championships. I compared CFL Semifinals to NFL Division Playoffs (in other words, the 3rd to last stage of the season). Then I compared the CFL Division Championships to the NFL Conference Championships. But this really means nothing. The NFL plays four rounds of playoffs. The CFL plays three. The NFL plays a total of 8 games in the first two rounds, the CFL plays 4. It is more reasonable for a fan to watch two games in a weekend than four. I took simulcasting into consideration when I mentioned the Super Bowl on CTV. I mentioned those watching on NBC when I was comparing Sunday Night Football (on TSN) to regular season CFL games (on TSN as well). I also took the NFL games during the CFL playoffs into account. No , it has been clear for many years. The CFL’S T.V. ratings in Canada Vs. the NFL are not even close during the regular season even going head to head with the NFL. Many studies have already been done taking every thing into account. It is not hard at all to find out the T.V. ratings for the NFL in Canada. That is a myth. They seem to be able to get the T.V. ratings for other kind of T.V. programs shown on U.S. / T.V. in , Canada. The truth is that the CFL is the second most watched team sport behind Hockey in Canada. The NFL is a distant forth. However , watching something on T.V. for FREE doesn’t make you a TRUE football fan. Buying season tickets does. Again , in the case of Ontario [as just 1 example] far more people in Ontario have TORONTO ARGO and HAMILTON TI-CAT season tickets than Canadians who have Buffalo Bills season tickets. So the CFL clearly wins the T.V. ratings battle during the regular season and during the play offs. It also wins the ticket buying battle as well. Why should this surprise any one? The CFL has Canadian teams involved. Sometimes the Superbowl gets more viewers than the Grey Cup and visa versa. The Superbowl is on more T.V. sets in Canada because CTV is FREE T.V. TSN , is not [another + for the CFL because people will pay to see TSN]. It is a PRO NFL Toronto sports media driven myth that the NFL is more popular in Canada [Ontario] than the CFL is. This was also shown by the fact that the BILLS in Toronto games completely bombed forcing ROGERS to give away 10s of thousands for FREE [there is that word again] tickets as to not make fools of themselves. TOO LATE. The NFL and BILLS owner must be laughing at Toronto all the way to their banks. Some so called NFL football fans and some sports writers in this country are NOT the sharpest tools in the shed. Does it really make great business to dump on your own countries culture [which creates jobs in Canada] to blindly support another countries culture by mostly paying for and / or [even worse] FREE of any charge? It makes as much sense as cross border shopping does. DOH!!! This post is over a year old, and again, I think you missed the point. I love CFL. I’d love to know what makes NFL a distant fourth? Is it curling? Curling does get great ratings (for the big events at least); however, its only on a few weeks a year. And not week-after-week like all other team sports. It’s more comparable to golf or tennis than football or hockey. Basketball and soccer certainly aren’t above CFL. And there’s nothing distant about it. Sunday Night/Monday Night Football gets in the 500, 000-600, 000 range many weeks. A little behind the CFL (100, 000-200, 000) and about on par with many NHL on TSN games (but not HNIC or Leafs on TSN games). As far as supporting teams. It would take quite a fan to commit to going to Buffalo every other to watch a game. Considering there are no Canadian teams in NFL and 8 in CFL, season tickets is a completely irrelevant matter. And again, the point is about which does better on TV. This is a media blog. The Super Bowl is on more TV sets, as I’m sure I mentioned. And hence it gets more casual viewers. I’d be willing to guess the majority of sports fans in Canada get TSN. Between having 1 NHL playoff series featuring a Canadian team, every CFL game, every CCA curling event and other big events, it would be hard to live without it. Sorry , but I haven’t missed any point. You write that FOOTBALL is the second most popular sport in Canada. 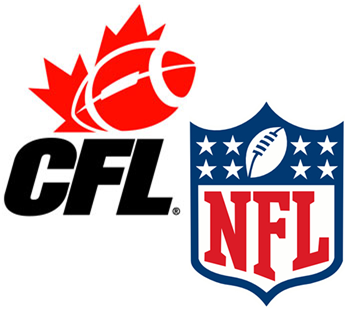 The CFL , has been the most popular kind of football for years during the regular season in Canada but not the NFL. In 2011 that was the first time in HISTORY that some of the CFL play offs were beaten by some NFL play off games. The CFL is the SECOND most popular sport in Canada on a regular basis. Just ask TSN and / or look at BMS. This year  the average CFL regular season game was watched by 750,000 to 1 million in , 2012 [that is for about 80 games]. As just 1 example , the last ARGO Vs. SASK. in their regular season game of 2012 was watched by about 1 million viewers. That was 200,000+ more than a World Series game going head to head with the CFL. That was also 300,000+ more going against the NFL. The NFL on TSN has never broken any of the CFL’S viewing records for any kind of football [CFL regular season games or play offs]. “The 13th Man” [about SASK.] also broke a record for a documentary for any show of it’s kind of any sport [500,000+]. No regular NFL regular season game on CTV has ever beaten TSN’S CFL record T.V. ratings. They BLUE JAYS are the 3rd most watched sports team in Canada. Your facts are out of date. CFL T.V. ratings were way up in , 2012 with all age groups across the board. 5.6 million watched the 2012 Grey Cup in 2012. A record for ANY football sport on TSN . 3.6 million watched the big game in the Toronto area alone. Another record. 13 million+ Canadians watched some or all of the 100th Grey Cup. You say that ticket sales do not matter…??? People show their true support with their wallets. I would think that any league would be out of business if people didn’t buy any tickets to see their games live. So ticket sales are far from being irrelevent. Ticket sales are the only true test of support. Not watching something on T.V. for FREE. They are almost every thing to any league. You say that love the CFL , so why is it so hard for you to believe my FACTS. You should be happy the the CFL is so strong on T.V. Football is the sport. CFL is a league. Saying that football is the second most popular sport in Canada is in no way incorrect. I never once said that baseball was more popular than the CFL. Although for a time when before they fell out of the playoff race the Jays head-to-head ratings were similar to the CFL’s. The Jays ratings are generally behind the Canucks and the Leafs, which does make them third. It is really impossible to compare them to any one CFL team because CFL games will always have a large sector of fans watching for the other team. And I never said that NFL regular season (which is mostly all that TSN has ever shown for NFL) gets better ratings than the Grey Cup. I don’t dispute that the Grey Cup and the Super Bowl are the two highest rated football games in Canada every year. Some years the NFL wins, some years the CFL wins. I never said ticket sales don’t matter. I did say I’m not comparing the popularity of the two leagues; just the TV ratings. The closest CFL and NFL teams to where I live are in Montreal and Boston. The only viable way for me to consume any pro sports is on TV, so sorry if my opinion is different than your’s. Your facts may be facts, but none of them really prove anything. Sure 13 million Canadians watched some of the Grey Cup. 18 million watched some of the last Super Bowl. And yes, CFL ratings are up this year, but they are also still slightly down (4%, I think) from two years ago. All of these are also facts. I am happy that the CFL does well. It is a Canadian business and a great league. I never said I wasn’t happy (or even didn’t accept) that it does so well on TV.